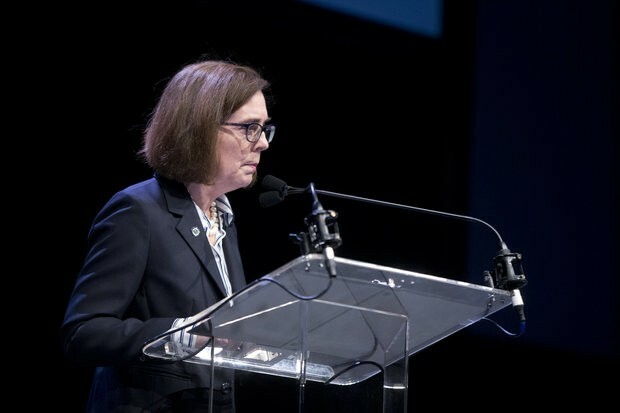 Despite promising transparency and the “timely release of documents” when she took office, Governor Brown took a page out of Governor Kitzhaber’s book when her office deleted the opinions of state recruiters, paid $65,000 to recommend a DEQ Director, before releasing records about the search process after they appointed someone else. You wouldn’t know that a recruitment firm, which Oregon paid $65,000 to find the department’s next leader, “strongly recommended” Whitman. Or that the recruiters thought the other finalist, Leanne Tippett Mosby, should be strongly considered but would need orientation before starting. Brown’s office deleted the opinions offered by the state’s recruiters before releasing records about the search process requested by The Oregonian/OregonLive. The information would’ve remained a state secret — except the state Department of Environmental Quality already released the same records to the newsroom without redactions, offering a complete picture of what Brown tried to shield from public view. Brown’s office last week released 786 pages of records, including text messages and emails, showing the behind-the-scenes machinations leading up to the governor’s March dismissal of three state environmental commissioners. The three appointees were fired just more than a month after they voted to hire Whitman, Brown’s former advisor, as the department’s leader. Records previously obtained by The Oregonian/OregonLive have revealed contradictions in Brown’s reasoning for firing the appointees. While the governor has repeatedly said she supports Whitman, she has also said she was unhappy with the almost year-long search that netted him. Emails have shown that Brown tried to prevent Whitman’s hiring, threatening to pick the next environmental quality leader herself. The contradictions have cast a shadow over the new director at a time when he’s supposed to be leading major change at the agency in charge of protecting Oregon’s air and water. Brown’s redactions are particularly remarkable since they were made by a governor for whom transparency has been a hallmark since she replaced Gov. John Kitzhaber in 2015. Brown’s public records attorney, Emily Matasar, justified redacting the passages by citing an exemption in records law that lets agencies withhold advisory communications that are the topic of preliminary discussion. Bryan Hockaday, a spokesman for Brown, said it’s the governor’s policy to redact such material. He said disclosing evaluators’ impressions of job candidates would discourage honest and frank discussions about them and could affect their future job prospects. Brown’s office blacked out all criticisms of Mosby but not of Whitman. There could be concern about Mosby’s ability to adapt to Oregon, the recruiters said, since she’d lived in Missouri her whole life. But she had the street smarts and interpersonal skills to quickly adapt, they wrote, recommending orientation if she was hired. Those remarks were deleted. In contrast, Brown’s office didn’t delete Whitman’s acknowledgements to recruiters that he had unnamed detractors who would oppose his hiring. The consultant said if he was picked, “some might protest that the entire search was a sham and that his hiring was a fait accompli” – a foregone conclusion. The commission had already approved Whitman’s hiring as the agency’s interim director in October. He left his job in the governor’s office to take the role. Colleen Johnson, one of the fired commissioners, questioned the decision to shield the details from the public. Brown is an avowed transparency advocate who’s made reforming the state’s public records laws a central tenet of her tenure as governor. Since taking office in 2015, she has hired an attorney to process records requests, released tens of thousands of pages of records and championed legislation to create a state public records advocate. But Brown hasn’t always been consistent. Earlier this year, she introduced legislation on behalf of the Oregon State Veterinary Medical Examining Board to make private the names of veterinarians who are fined. Brown withdrew the bill after The Oregonian/OregonLive wrote about it. And she drew criticism in 2015 for signing legislation to exempt the names and addresses of home health care providers – information that the state stalled releasing while the Legislature passed a law allowing it to be kept secret. In the request for documents about Whitman’s hiring, Brown’s office withheld six emails entirely, claiming that they are exempt from disclosure. The Oregonian/OregonLive plans to petition for their release.